"Steak Festival" at "The Bistro"
Novotel Ambassador Gangnam offers an affordable steak table featuring Australian premium beef steak along with unlimited wine & beer and dessert buffet. The steak menu has been affordably priced at just 47,000won, a great bargain for a hotel restaurant steak. 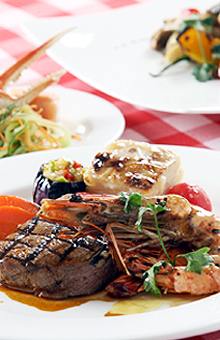 Guests can choose the main dish from a set of Australian beef steak or prawn dishes, making it an ideal choice for couple guests. Following the main dish will be 10-kind dessert buffet including chocolate, strawberry tart, cream and more. Also, unlimited wine and beer will make your dining more pleasant with the live jazz performance at the Lobby Lounge. Reserve your table now and enjoy our special Australian beef steak with great value.